As a reminder, if you’re regular foot you’ll be surfing on the port (left side) of the boat and if you’re goofy foot, you’ll be surfing on the starboard (right side). Check out our FAQs if you’re unsure of what ‘foot’ you are! Shout out to our friends at The Ski Monster for this comprehensive overview. We’ll want to make sure you’re set off to a 45º angle from the stern versus directly behind the boat. This will keep you out of the propeller’s wash and also allow the wave to build behind you and get your footing and balance in the calmer water. You want to avoid being right behind the boat or on top of the wave while it’s forming, or you’ll end up at the peak and have to surf back down the steep wave! Now that you’re in the water at a 45º angle off the boat, get you feet on top of the board. You want your feet to be at a comfortable width, a little more than shoulder width is what we recommend. Notice in the picture how my heels are on the board and I’m relaxing with my toes pointing to the sky – that is crucial! Let the board float in the water and just rest your heels on the edge of the board. The closer your heels are to the edge of the board the easier it will be to flip on to your feet. Do not flop and fight to attempt to get your feet flat on the board while laying in the water…that will come next. Notice in the picture, my heels are on the edge of the board, toes pointing to the sky, rope in between my feet, shoulders squared up with the board pointing at the corner of the boat. What you can’t see is that I’m in a tucked cannonball position, similar to what you’d do if you were doing a cannonball off a diving board. Step 3 | Boat in gear, rope tight, heels down! In order to get up, the driver needs to work in coordination with the surfer. Once we have the surfer set up on the board and off the corner of the boat with slack in the rope, the driver will put the boat in gear. This takes the slack out of the rope, and the coach will tell the wakesurfer “Heels Down!” once the rope gets tight. Once the driver sees the board flip up to the bottom of the feet, he will hit the throttle and they’re up. 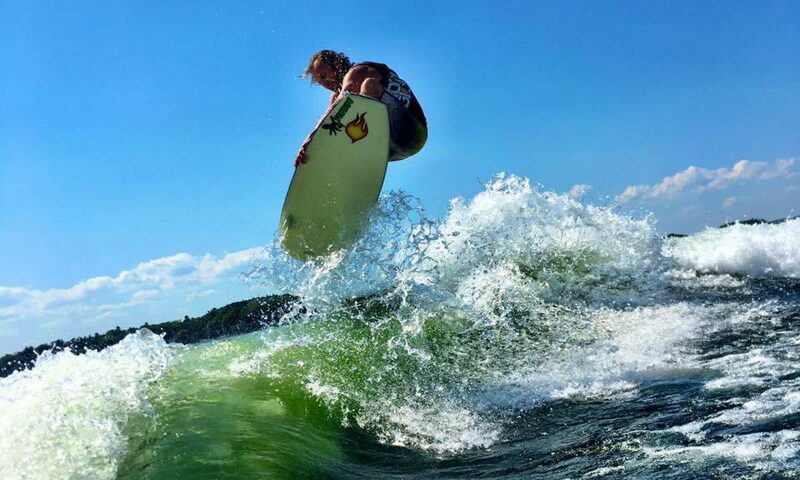 Wakesurf boards have a lot of surface area it doesn’t require much power to get someone up. We’ll then throttle the boat slowly up to surf speed, approximately 11.2 mph. You’re up!! That’s awesome you made it, now the fun begins. Like any other board sport you want to make sure you are balanced and centered on the board, have your weight close to 50/50 on each foot and try to stay at the bottom of the wave while you get your bearings. If your feet aren’t correct, this is the time to get them right. Inch your feet forward/back/sideways as if you were squashing a bug, but don’t attempt to lift your feet of you’ll ‘banana peel’ and fall. Once you feel comfortable on the board, you’re going to let go of the rope with your trailing (back) hand and hold the rope with one hand. In my case, I’m surfing regular and hold the rope with my left hand. We call your front foot the gas and your back foot the brake. If you want to speed up, apply pressure to your front foot by shifting your weight forward through your hips. To slow down, apply pressure to your back foot. The key here is making small, subtle movements and not huge weight shifts! As you speed up you’ll notice the rope will get slack, and if you hit the brakes too hard the line will get tight and you’ll ‘go over the falls’ and arms get yanked! Now that you have the feeling of ‘gas and brake’ figured out its’ time to find the sweet spot on the wave. Every boat is different, and on our boat the sweet spot is very large, so it’s fairly easy. Keep the rope in your lead (front) hand and try to keep the rope slack in front of you as long as you can. This will help you find the boundries of the wave without falling constantly. If you find yourself coming in too hot, you’re going to want to hit the brakes. In doing so, you’ll lose all your speed so you immediately need to get back on the gas by shifting your weight forward and driving your rear knee forward and down, toward the center of the board. A similar leg/hip shift maneuver can be found in the follow-through golf swing of a pitching wedge. Once you have found the sweet spot on the wave and you can stay in it for an extended period of time while keeping slack in the rope, it’s time to toss in the rope. Make sure the rope gets pulled all the way into the boat so it doesn’t get caught on the wakesurfer if they were to fall. The approach must be done from the back of the wave and done with 100% confidence every time. Wavering on your approach will only cause more difficulty with the trick and landing! The trick needs to be completed with precision every time, and the rope can/should be used to help perfect your tricks before going for the ropeless version. Like golf, tricks like airs and 360ºs don’t require much effort at all…in fact, the less effort, the better. This will help you control your landing.